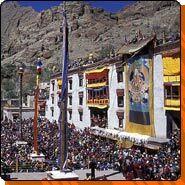 Hemis is the biggest and the most important monastery in Ladakh. 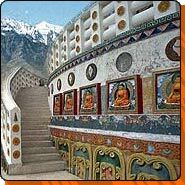 It is situated 49 kms south of Leh, a little off the main Leh-Manali road. It was built in the 17th century by Chapgon Gyalshas and has ever since enjoyed the patronage of the royal family. In 1956 the head Lama Hemis Gompa disappeared, never to be seen again. 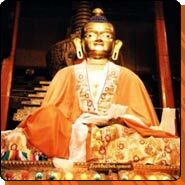 A 12 years old boy was brought from Dalhousie in 1976 to be appointed as head Lama. He will assume authority after his training period is complete. Sight-seeing of Kalimpong, drive to Jaldapara Sanctuary. Overnight at Forest Lodge. The monastery contains quite a few gold statues and stupas decorated with precious stones. It has a superb collection of tankhas, including one which is supposed to be the largest in existence and is exhibited only once every 11 years. 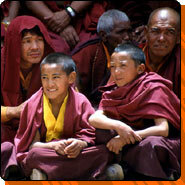 The annual festival of the monastery, with its masked dances, is a big tourist attraction.